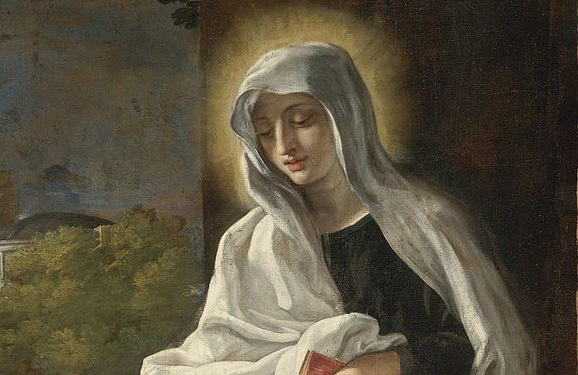 St. Frances of Rome could have lived an easy life, full of food, parties and pleasure. But she didn’t want an easy life. She wanted to serve Christ by serving the poor. Born in 1384 to a wealthy Roman family, Frances married at age 12 into an equally wealthy Roman family: the Ponzianis. Her husband, Lorenzo, was a good man — generous, kind and enamored by his bride. Frances, however, was initially disappointed with him, as she would have been with any match. She wanted to become a religious and found the social obligations of marriage almost unbearable. Help soon came, though, through her sister-in-law, Vannozza, who also longed to live a life of service and prayer, and together the two devised a plan that allowed them to pursue spiritual disciplines while still carrying out family obligations. Not long afterward, in the early 15th century, famine struck Rome. With the help of her sister-in-law and the support of her husband, Frances ordered that no one who came to the Ponziani palace begging for food was to be turned away. Corn and wine were distributed liberally until her father-in-law learned of her generosity. He ordered Frances to stop. She refused. So, he sold off the family’s extra corn and wine, keeping only what the family needed. Frances continued feeding the poor just the same, emptying their corn loft rather than allow others to go hungry. The loft never completely went empty, though, for on the very day Frances gave away the last kernels, the entire supply was miraculously replenished. The same happened with the wine. When the family cask ran dry, new wine mysteriously appeared in it, finer than the previous wine. Frances would go on to form a small community of like-minded lay women committed to caring for the poor: the Oblates of Mary. After her husband’s death in 1436, Frances lived with the Oblates for four years, serving as their superior, until her own death in 1440. She was canonized in 1608. Support an organization that feeds victims of famine, war and systemic national poverty. Make a meal for a family with a new baby. Invite a young family or a person who lives alone to join you for dinner. This article originally appeared in OSV Newsweekly.